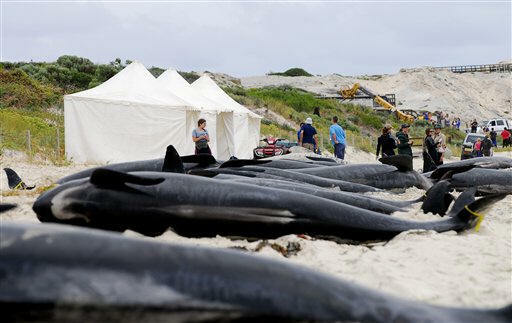 [March 24, 2009] PERTH, Australia (AP) -- Eleven long-finned pilot whales were returned to sea Tuesday after surviving a mass stranding on a remote southwest Australian beach and most appeared to be swimming away after some initial disorientation, an official said. Two were still lagging slightly behind the others and another appeared unwell and was brought close to shore for monitoring, said Laura Sinclair of the Department of Environment and Conservation. "Eight of the 11 appear to have been successfully encouraged back out to sea after initially trying to return to shore," Sinclair said. "Another two are following at some distance." The animals had been trucked overland in the morning to a bay with deeper waters in an attempt to save them after nearly 70 others died when they beached themselves early Monday in Western Australia state. Rescuers moved them out 100 yards (meters) to sea off Flinders Bay but the whales initially began moving back to shore. Sinclair said that was not unusual and that rescuers on Jet Skis, boats and surfboards redirected them. 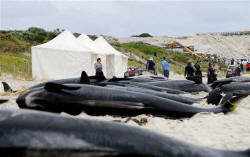 The group of 87 whales and five bottlenose dolphins beached themselves early Monday in Hamelin Bay. One dolphin and 72 whales died before they could be rescued. Volunteers and government employees worked all day and overnight to stabilize the survivors, keeping them wet and moving them into one pod in a safe holding area with slightly deeper water. Most beached whales die of dehydration, overheating or from their weight, which can crush their internal organs once they leave the weightlessness of the water. Rough seas and high waves hampered the rescue effort at Hamelin Bay and officials decided to move the surviving animals overland to deeper, more protected waters in Flinders Bay, about 12 miles (20 kilometers) away. Four whales and four dolphins were pushed back to sea before the move, Sinclair said. The remaining 11 whales -- which measure up to 20 feet (6 meters) long and weigh up to 3.5 tons -- were loaded into trucks by slings and individually transported to the new location Tuesday morning. It was the latest mass beaching of whales in Australia. Strandings happen periodically in Tasmania, in the southeast, as whales pass during their migration to and from Antarctic waters, but scientists do not know why. Department staff and scientists took measurements and DNA samples from the dead whales and dolphins to allow scientists to assess the genetic information and population structure of the pod. The dead whales will be transported to a nearby waste disposal area. Earlier this month, 194 pilot whales and seven dolphins became stranded on a sandbar in Tasmania and only 54 whales and five dolphins were able to be saved. In January, 45 sperm whales died after becoming beached on a different Tasmanian sandbar. There were also two mass strandings in Tasmania last November.